The beach in Tripoli, Libya, in 2011. Are cities worldwide really becoming less livable? An annual report released this week that got lots of media attention says yes, but the report also shows how hard it is to measure such a subjective quality. Each year, the Economist Intelligence Unit — a corporate cousin of The Economist magazine that provides forecasting and advisory services — ranks cities by how livable they are for people who might move there for jobs. And since 2009, cities have become less livable — by seven-tenths of a point, on average, on the EIU’s 0-to-100-point scale. Cities are rated in five categories, and one is the chief culprit for the decline: stability. 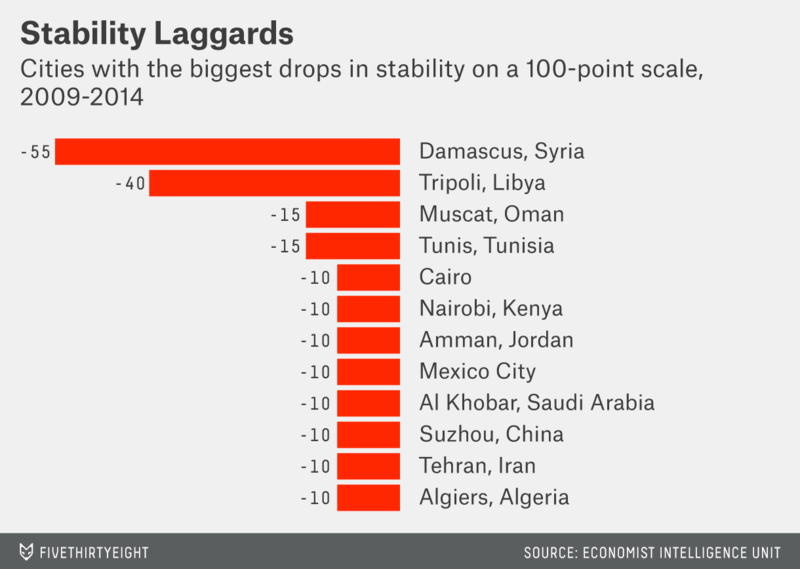 The 140 included cities, on average, dropped by 1.4 points on the stability scale. Scores in the other four categories dropped, but by much less. Stability accounted for about half the decline in global urban livability, by The Economist’s reckoning. And that’s just the direct cost of instability. Jon Copestake, who edits the EIU’s livability index, said instability also indirectly contributed to declines in the categories of health care, culture and environment, education, and infrastructure. The EIU’s conclusion that livability is declining may seem suspect — measuring livability and stability is a fundamentally inexact, subjective enterprise. The EIU leans heavily on correspondents, one per city, to evaluate their hometowns. More than 80 percent of the component scores that go into each rating are based on the judgment of correspondents, which are then honed by staff with knowledge of the region. That is the process for all five of the components of stability: the prevalence of petty and violent crime; and the threat of terror, military conflict, and civil unrest or conflict. The ratings could instead use quantitative data sources for many cities. But for just about every category, data wouldn’t be available for at least one city, Copestake said. And the EIU doesn’t just take them at face value, Copestake said. It compares the correspondents’ ratings with whatever third-party sources it can find. “We’re investigating sources all the time, to back up the scores we provide,” he said. Without checks, the EIU could risk declaring a decline in stability because it had a group of particularly tough graders one year. Three other stability ratings don’t argue with The Economist’s conclusions. The World Bank-funded Worldwide Governance Indicators (WGI) evaluate countries on six factors. One is political stability and absence of violence. The latest available report is from 2012. The EIU and WGI project agree on the places that have seen the most destabilization in recent years. Stability scores declined the most in Damascus, Syria, and Tripoli, Libya, according to the EIU. And Libya and Syria were the two countries with the biggest declines in stability, according to the WGI. Picking up where the WGI left off, Maplecroft, a risk-analysis company, found that Syria had the biggest increase in risk between 2012 and the third quarter of this year. Libya ranked fourth. Political risk overall increased globally, according to Charlotte Ingham, principal political risk analyst at Maplecroft, with an increase of 4 percentage points, to 36.5 percent, in the share of countries that fell into the highest risk category. “The global political risk trend is increasing as the rate of improvements, where they are occurring, is insufficient to outweigh the rapid rate of deterioration witnessed in a host of other countries,” Ingham said. The WGI stability indicator can’t be used to identify global stability trends, because the global average is set to zero each year, said co-creator Aart Kraay in an email. However, the Global Peace Index can. And the median rating in the nearly 150 countries rated has increased by 5 percent between 2009 and 2014, where a higher score means less peace. On a per-person basis, the producers of the index at the Institute for Economics and Peace say peace has declined by 12 percent since 2008. With a dearth of hard stability numbers, there’s something a bit circular about the agreement. The Global Peace Index draws on the EIU and the WGI. The stability declines are relative to 2008 or 2009 or 2012. It’s possible the world is more stable today than in, say, 2002. The Global Peace Index began in 2008. Maplecroft’s index in its current form dates back to 2011. And the EIU didn’t compare this year’s index with any prior years besides 2009, so Copestake couldn’t say whether that was a high-water mark for stability. The decline was subtle. Over the past five years, the vast majority of cities — including the 20 most stable ones today — didn’t experience any change in stability, according to the EIU. 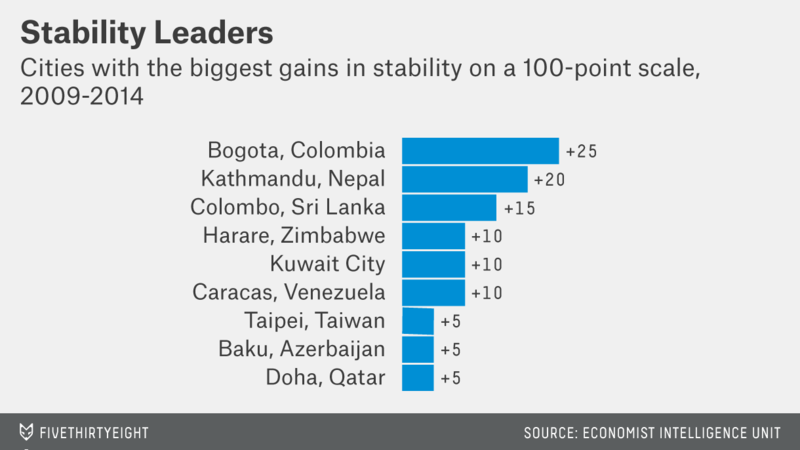 And nine cities, led by Bogota, Colombia, became more stable.